Sri Lanka Prime Minister Ranil Wickremesinghe on Saturday accused the country’s print media of backing the former President Mahinda Rajapaksa with a view to see him back in power. Addressing his United National Party (UNP) members in the central district of Kandy, Wickremesinghe said he would name the media personnel who had benefited during the Rajapaksa presidency and who are now bidding for his return. He named the Daily Mirror, the English daily, and Financial Times daily, for allegedly favouring Rajapaksa. He said the Daily Mirror had called for the removal of Mangala Samaraweera, the foreign minister and the Financial Times was trying to undermine the government’s economic management. 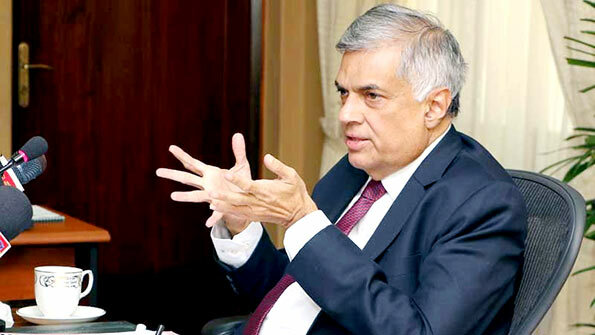 “I have no issues of media becoming critical of the government, do it as you please but do not try to call for the return of rogues,” Wickremesinghe said. “If they are trying to topple this government and bring him (Rajapaksas) back, we are ready for it,” he said. Referring to the Rajapaksa group’s opposition protest march from Kandy starting next week, Wickremesinghe said, “Let them walk, we are ready, we too can bring people to the streets”. Let us give the Sena-Singhe Government a chance following the decision to unitedly govern the country for 5 years from Aug 2015. The Opposition (ie the joint Opposition and not the TNA lead dead opposition) should play a responsible role in pointing out deficiencies of the Government, providing meaningful and supported amendments to the Government’s proposals and developing policies that they will follow in a future Government when opportunity arises. Opposition talks and actions of ‘overthrowing’ the Government may appeal to the masses but are absolutely negative. Democracy provides for removal of Governments through the ballot and not through street uprisings. The admirable aspects of the Sena-Singhe Government include (1) non racist (2) independent governing institutions (3) reduced tolerance of corruption (4) an economic vision and drive to achieve that vision (5) freedom and fearless existence (6) pursuit of past corruption and (7) integration with the World. Let us give them a chance and do our work while they do theirs. I tend to agree with Chie d’Zylva; it’s been a year since the Sena-Singhe Government was elected to Parliament and much has been achieved. Prices of essentials may have risen but there is a feeling of freedom and prosperity among urban and rural masses. Except for the Bond Mahendran corruption flare-up, a general sense of discipline, openness and fairness is noted. The lower levels in Parliament includes a number of clowns; the higher levels demonstrate responsibility and care. As Chie says, ” Let us give them a chance and do our work while they do theirs”. I think think these jokers have and enough time and chances to get their act together. The problem is MY3 and RW keep bringing up the Rajapakse’s every single day. They won’t let the people for get the Rajapakses’s. Their seems to be a general sense of discipline and open ness. I don’t think that is true . \\majority seems to think these government will not make it . And as for corruption , That has not stopped because we have the same lot of clowns in office only thing is they have jumped fences so many times they don’t even know which party they belong to any more. The big boss him self jumped fence when he was offered the ultimate position. Until then he did not know what was happening around him and one day it all dawned on him that MR and his clan were all crooks. That is amazing. I wouldn’t classify the current crop as jokers. They are men with a mission. MS is trying to grab a foothold in the Blues Party while the Greens are building a succession plan. It is terribly disheartening to observe the corruption perpetrated by the R Family; it all began with the Tsunami Finds which the former CJ openly admitted that he had let go Dad R in the Courts. It is terribly frustrating to note young men such as NR ad Yo indulge in multi-billion transactions fleecing the country. Believe it comes from the poor family background with a blind father and a treasure-digging mother.